No other spirit has as deep and rich a legacy as rum, best exemplified by the fascinating story of the 300-year history of the daily ration given to members of the British Royal Navy. It’s a tasty tale that involves much more than the stereotypical swashbuckling pirates and drunken sailors who prowled the Caribbean. These intrepid seamen were arguably the first rum connoisseurs, creating blends centuries before Scotch and other sipping spirits. They also created the Grog, arguably the world’s first cocktail. There’s no better person to share this story than rum expert Paul McFadyen, co-owner of the Trailer Happiness bar in London and brand manager for Plantation Rum in the United Kingdom. McFadyen presented his Navy Rum seminar in April 2013 at the annual Miami Rum Festival, which had another successful run in 2014 and will return for its seventh year in 2015. 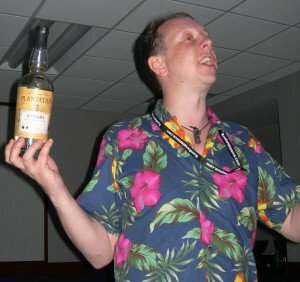 McFadyen spoke this year about agricole rum, the unique style born in Martinique and enhanced by French techniques. But British-style Navy rum is a whole different animal, as we learned during last year’s seminar at which McFadyen not only took us on a trip back in time, but also make his own blend by combining rums of various styles into a tasty makeshift Navy rum. 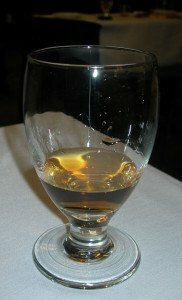 In order to explore the legacy of the British Royal Navy on rum, drinking and cocktail culture, one must start in the late 1500s and early 1600s, a time of “licensed piracy and drunkards aboard ships with cannons in the Caribbean,” McFadyen said. Originally, the ships sailed with beer. But, like water, it would spoil. But the Brits would make do by pillaging any port they came across, taking port, madeira, sherries, wines, “pretty much anything they could steal from the Spaniards or the French,” McFadyen said. By the time the British took Jamaica, rum had already been developed in the Caribbean. Spain had a foothold in the region, using Haiti, Hispaniola and Cuba as a stopping off point in the trading lanes with Central America. McFadyen says that by 1655, the British “wanted a piece of the action” and assembled a massive fighting fleet to attack Hispaniola. But they were defeated, falling back to Jamaica. It was right in the heart of all the Spanish-held islands, and the deep-water Kingston Harbor provided the perfect stage for the British to attack the Spanish fleets as they passed through. Some of the most famous of whom we consider pirates, such as Henry Morgan (who later inspired Captain Morgan rum), would have been offended to be called pirates since they actually had approval and were working under license. Coincidentally, Jamaica also offered perfect sugar-growing conditions, and with all the privateers and the Naval fleet off the coast, it saw an explosion of rum. Rum rations were officially issued daily to sailors beginning in 1655, ending in 1970. By 1731, after lobbying from the Jamaican rum producers, the rations were officially raised to a hefty one pint of overproof rum per man, per day. The original ration was a half-pint. The reason for the rum being overproof was simple: Besides gunpowder, liquor was the most important thing on the vessel and they were stored together under lock and key. But it was important that the rum and the gunpowder should never mix. Wet gunpowder would not be good for the ship’s munitions. “So it was important that the rum was at a strength where even if it mixed with the gunpowder, it was still damn explosive and would go off,” McFadyen said. This is where the terms “proof” and “overproof” come from. As a result of all this high-proof rum being consumed, “you can imagine the problems this caused,” McFadyen said. The practice of compulsorily diluting rum in the proportion of half a pint to one quart of water (1:4) was introduced in the 1740s by Admiral Edward Vernon (known as Old Grog, because of his habitual grogram cloak), who was in charge of the fleet in the Caribbean. To this day in countries like Australia and South Africa, “grog” is the everyday word for booze. It started centuries ago with the sailors referring to what they were drinking on the ships. It was a “wonderfully sophisticated rum from a diverse number of countries around the Caribbean,” he said. It was enjoyed for centuries in a ritual signaled by the whistle of the Bosun’s Call and the declaration “Up spirits!” But eventually, all good things must end. In 1850, the ration was reduced to a quarter pint (5 fluid ounces), then to an eighth pint (2.5 ounces). On July 31, 1970, the final rum ration was issued. “It was pretty much the breathalyzer that put an end to it,” McFadyen said. The British police used to wait for the sailors to come off the ships and get in their cars to drive home. “The thought was that if they were too drunk to drive, perhaps they shouldn’t have their fingers near the buttons of nuclear vessels,” he said. The rum ration was replaced by three cans of beer, and the event was sadly celebrated. Barrels were buried at sea, McFadyen said, and headstones were set up in the Caribbean: “To rum, a dear departed friend.” Black Tot Day is still celebrated in the Navy, where they dearly miss their rum ration. So is it still possible to find authentic British Naval Rum? 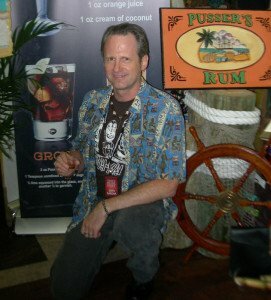 “Pusser’s is the closest recreation of what was drunk on board the Naval vessels,” McFadyen said. Introduced after rum rations were discontinued by using the same recipe used by the British Navy, it was essentially a co-branded product. A portion of the profits from Pusser’s, a multi-island blend, goes to the Navy. 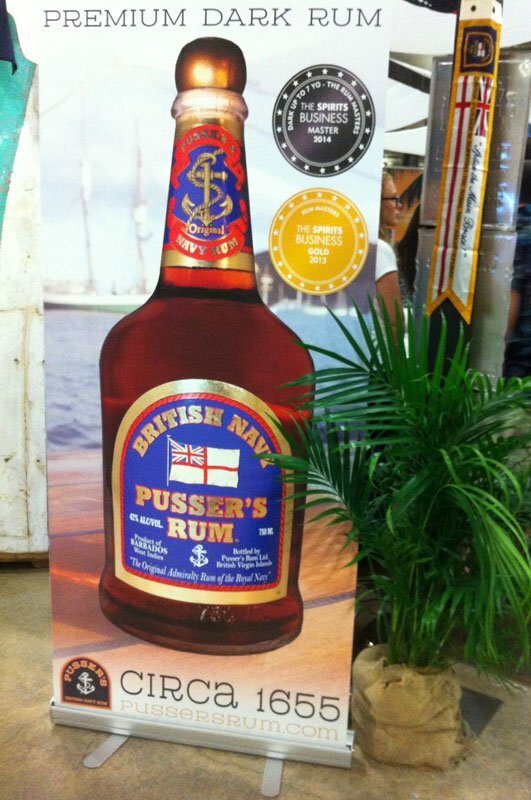 Though Pusser’s made a splash at the 2014 rum fest, there were no Navy rums on hand in 2013. 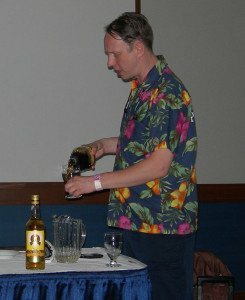 So McFadyen was forced to improvise his own blend (see photos above), which was more impressive than simply tasting one that had already been blended. “A Naval rum style would generally be a mix of lighter rums, sweeter rums, darker rums,” he said. This includes soft and sweet rums from Barbados, spicy and elegant rums from Trinidad (“still the backbone of Pusser’s”), the funky and rich Jamaican rums, and the smokey and sweet Demerara rums from Guyana. McFadyen made his own tasty blend by picking rums from English-speaking islands that were at the festival. 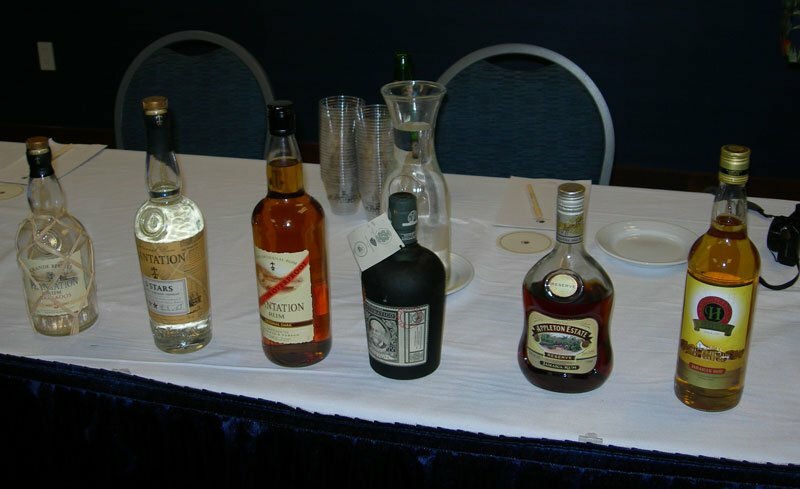 Even though there was no Demerara rum to choose from, he made a very flavorful recreation by using six rums of various styles and flavors, including brands from Barbados, Trinidad, Jamaica, and Venezuela [see photo]. 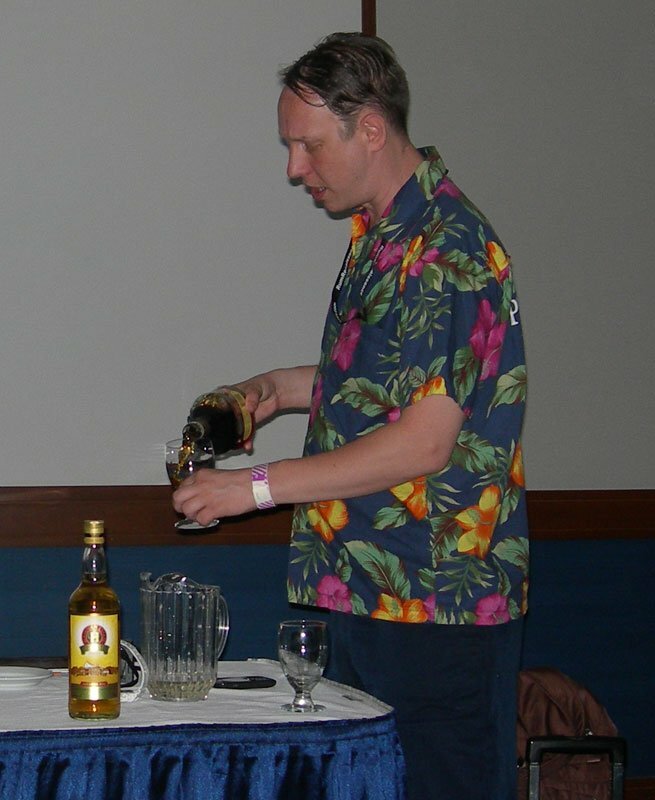 Finally, he examined some of the classic Tiki drinks (Painkiller, Navy Grog, Mai Tai, Zombie) and noted that they contain essentially a Naval rum blend. Tiki cocktail pioneers Don the Beachcomber and Trader Vic often blended multiple rums in the same drink. The legacy of rum and the British Navy “is not just about a bunch of guys on a wooden ship 300 years ago, assing around the Caribbean,” McFadyen said. What has stood the test of time is the fine craft of blending rums. The ancestor: The classic Painkiller was invented at the Soggy Dollar Bar in the British Virgin Islands in 1971 and is still served there today. Originally made with a mix of Mount Gay and Cruzan dark rums, it’s now made exclusively with Pusser’s British Navy Rum from the Virgin Islands. The traditional recipe, as published in Beachbum Berry’s Grog Log (1998) and Beachbum Berry Remixed (2010), calls for 4 ounces of pineapple juice, 1 ounce of orange juice, 1 ounce of Coconut cream, 2 1/2 ounces of rum (Pusser’s or a good dark Jamaican), plus powdered cinnamon and ground nutmeg. The Floating Rum Shack has some boozier variations. The ingredients: For The Atomic Grog, we’ve jazzed it up a bit with three different rums (including Pusser’s), plus some spicy and sour elements. Enjoy, ye mateys. The mix: Pulse blend everything except the cinnamon and nutmeg with 1 cup crushed ice for 5-8 seconds, or until foamy. Don’t over-blend. 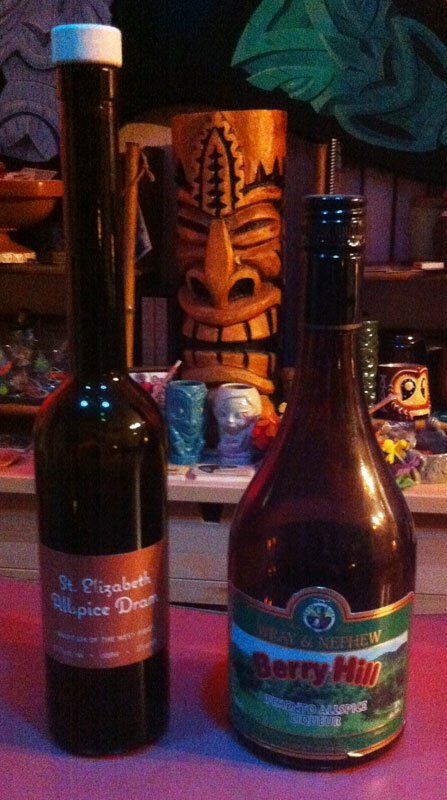 Pour into a large goblet, Tiki mug or specialty glass. Add more crushed ice to fill. Dust with cinnamon and nutmeg. Garnish with a pineapple stick and cinnamon stick. The taste: In this amped-up version, Pusser’s is still dominant, but the Kohala Bay and Smith & Cross add great depth of flavor. The lime adds a sour element to offset the sweetness, and Don’s Spices #2 brings more spicy and sweet flavors to the party. * Fresh juices are essential, especially the lime. Bottled OJ or pineapple are OK in a pinch, just make sure they’re all natural with no added sweeteners. * Don’s Spices #2 is an old-school ingredient employed by Don the Beachcomber back when he invented Tiki cocktails after the fall of Prohibition. He used coded recipes like this to keep his bartenders from knowing the recipes and stealing his drinks. Don’s Spices #2 is simply equal parts pimento dram and vanilla syrup. Just mix it up in a separate container so the flavors can meld. You can buy a bottled version from the B.G. Reynolds online store (they also have vanilla syrup). Pimento dram, a spicy rum-based liqueur from Jamaica featuring allspice berries, has become more readily available in the U.S. Look for the St. Elizabeth or Bitter Truth brands. If you’re lucky enough to travel to Jamaica, pick up a bottle of Wray & Nephew’s Berry Hill brand. Don’s Spices #2 is also a key ingredient in some delicious cocktails at The Mai-Kai, such as the Special Planters Punch, Black Magic, Deep Sea Diver and Samoan Grog. * Coco Lopez and Coco Real are the preferred brands of coconut cream, used most commonly in the Piña Colada. Don’t use coconut milk, as it won’t be sweet enough. I usually recommend the canned Coco Lopez if you’re making a bunch of drinks, and the Coco Real plastic bottle if you intend to store it and use later, since it keeps better in the fridge. 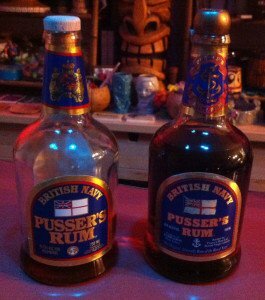 * According to Pusser’s, their British Navy Rum is the only rum blended in exact accordance with the Royal Navy specification last used when it discontinued its daily ration on July 31, 1970. It’s aged for a minimum of three years and is the product of five stills, three in Guyana and two in Trinidad. 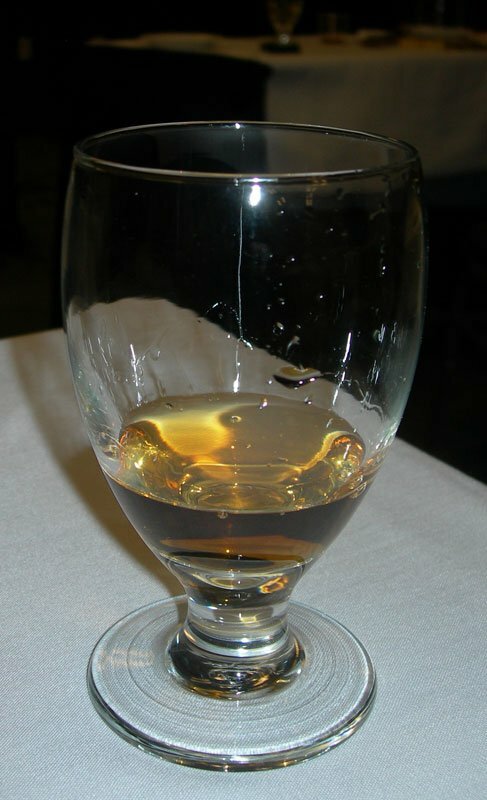 This is considered to be the same blend of five West Indian rums as issued on board British warships. The brand was launched in 1979 and began bottling in 1980. Note that there are two different Blue Label rums in the Pusser’s portfolio: An 84-proof version that’s sold in the United States, Canada, Virgin Islands, and elsewhere. And a new 80-proof version for the United Kingdom, Australia, etc. Previously, the U.K. version of the Blue Label was 109 proof, but that product will soon be available as the Gunpowder Proof Black Label (hopefully not limited to the U.K.). This was done in an effort to regain distribution at British Naval bases and mess bars, where the maximum strength allowed is 40 percent (80 proof) [see story]. 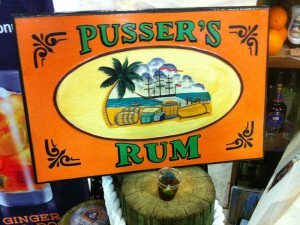 Pusser’s also makes an aged rum (available worldwide), spiced rum (U.K. only) and 150-proof rum (Germany only; coming worldwide) . For the purposes of mixing Painkillers, you want to stick with the Blue Label. In the U.S., we used to have a 95.5-proof Blue Label rum that was the standard for years. I still have some (see photo) and use it on special occasions, including one of these Painkillers, but I’m afraid it’s days are numbered. I’m curious to see how the Gunpowder Proof Black Label would work if I can ever snag a bottle. U.K. friends, take note. * The 114-proof “Navy strength” Smith & Cross Jamaican rum is a great product, based on the nearly forgotten “London Dock” style of Navy rum that was popular for hundreds of years before disappearing after World War II. It’s a descendant of England’s oldest producers of sugar and spirits, Smith & Tyers and White Cross. Note that Navy strength should not be confused with Navy rum, which is traditionally composed of rums from various islands, such as Pusser’s. Smith & Cross is produced by a Jamaican distiller using 100 percent pot stills, which accounts for its great, funky flavor. * For the third rum, I went with Kohala Bay, a dark Jamaican “punch brand” that’s distilled and blended in Kingston, then imported and bottled in the U.S. at 87.6 proof, also higher than the typical 80-proof dark rum from Jamaica. Kohala Bay is a descendant of the iconic Dagger brand, which was 97 proof and by all accounts an incredible rum. 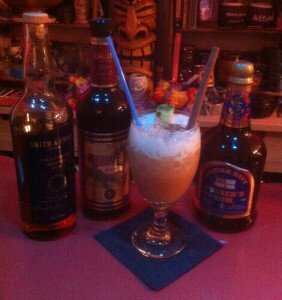 I discovered Kohala Bay while researching classic Mai-Kai cocktails, many of which are descendants of classic Don the Beachcomber recipes from the early days of Tiki that featured Dagger. The historic Polynesian restaurant in Fort Lauderdale has followed the same recipes for more than 57 years, and Kohala Bay has replaced Dagger as the key ingredient in many of the most potent drinks. Click here for more on Kohala Bay and The Mai Kai. Lacking Kohala Bay, you could substitute a superior dark Jamaican rum such as Appleton Estate Extra or Coruba, but they won’t have the dark flavor and higher proof punch. Blackwell Jamaican rum is perhaps a better option with its dark and bold taste that’s similar to a Naval rum. Postscript: If you’re looking for a lighter version of the Painkiller, try the Tiki Tiki Tiki Tiki Tiki Rum, as served at Trader Sam’s at the Disneyland Resort. Click here for the recipe in our recent story on Trader Sam’s. * What did they do with the drunken sailor? 2015 Miami Rum Renaissance Festival: April 17-19 at the Doubletree by Hilton Miami Airport Convention Center. More info at MiamiRumFest.com and Facebook. This entry was posted in Cocktails, Culture, Events, History, Recipes, Rum, Rum festivals, South Florida and tagged allspice liqueur, Atomic Painkiller, cocktails, Don The Beachcomber, Mai-Kai, Miami Rum Renaissance Festival, Navy rum, Painkiller, Paul McFadyen, Plantation Rum, Pusser's rum, recipe, rum. Bookmark the permalink.